THIS is it. The holy grail of aesthetic treatments. Muscle gain – and possibly weight loss – on a platter, no surgery involved. And, unlike older tech, it doesn’t get undone almost immediately. You may even get shredded. Picture that – undoing all the years of flab that a sedentary office life and a hectic work schedule have inflicted on you, without requiring a trip to the gym. Sounds too good to be true. So the skeptic in me bit when The Chelsea Clinic offered AUGUSTMAN a go on their latest Emsculpt tech. The traditional exercise we dread involves leveraging massive willpower and discipline to ambulate a number of moving parts. Plain English? We’re too lazy to move our asses normally. The Emsculpt is touted to remove the need for that willpower entirely. You could be sleeping, and the machine would still fire up those abs of yours. Enough sessions and your muscle gain – and boosted metabolism – is going to get that coveted fat burn going. All it’s supposed to take is four half-hour sessions over two weeks. Here’s how it went. TL:DR – It worked. No, it doesn’t hurt. But it is uncomfortable and, initially, very jarring. Well worth the gains, however. This is the beginning of a pipe dream where we literally lie down and have our workout done for us – as long as you can afford the steep cost. The science is fairly simple. One or two paddles are held in place over your abdominal area. These induce thousands of small electromagnetic (EM) pulses over the course of a half-an-hour session. Your tissues, being conductors, translate some of that flux into an electric current via induction. That current essentially causes targetted motor neurons to give the ‘go’ signal, and a contraction occurs. That’s not all. Because the whole thing happens so damned fast, the extent of each contraction far exceeds a natural one. This forces the body to cope with this increased strain with rapid muscle growth – the same way how bodybuilders push their gains to the next level with high-stress holds. Sorry, no smartphone usage allowed. Using electronic devices near such a potent (albeit short-ranged) EM field can not be good for your gadget. It’s only human nature to assume being ‘zapped’ by what looks like a defibrillation device is going to hurt. There is absolutely no ego or misplaced bravado at work when I say: it doesn’t. There is no pain. I say this boldly because the common definition of ‘pain’ likely refers to – or conjures up images of – piercing, excruciating jolts lancing their way through the nerves. The prick of a needle or an open bone fracture is going to cause that.So no, the Emsculpt doesn’t inflict the sharp pain we’re all averse to. What it does, however, is induce a great amount of discomfort. We’re not going to sugar-coat that. Want a rough idea? Take a forefinger and apply pressure at a single point to your forearm. Keep pressing. Press till the point right before you register ‘pain’. 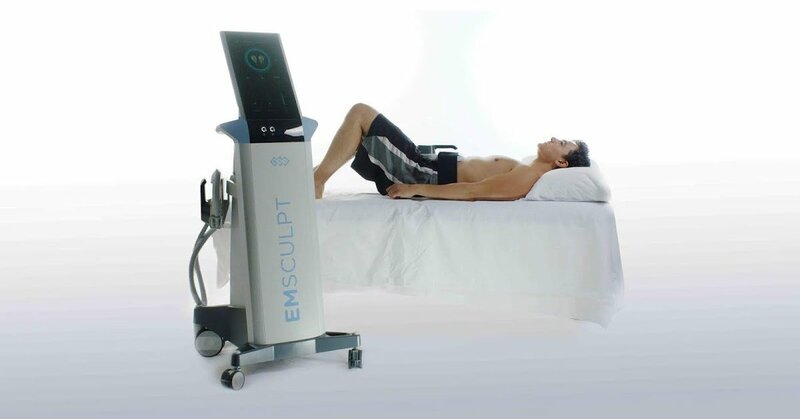 That degree of compression, and that dull, aching sensation that ripples out from the point of contact, are close to what the Emsculpt does to your core region. The EM pulses come in 30-second windows which, thankfully, ramp up slowly. The first ‘full blast’, a few minutes into the session, is going to leave you absolutely winded as most of the air is knocked out from your lungs. There are ‘relaxing’ half-minutes woven in so that the body, assisted by some sharper pulses, can get rid of lactic acid buildup. You’ll find yourself getting short of breath, which makes sense; your muscles are hard at work. You’ll learn regulating your breathing, in time with the peak and through of pulses is a necessity. And, as expected of any good workout, you could be breaking out in a little sweat. Your new best frenemy: The revolutionary Emsculpt machine. Dr Ewen Chee, founder and medical director of The Chelsea Clinic, drops a frank remark: those of already athletic make may feel a little bit more pinch than I did. Apparently, my ample padding has helped to take the edge off somewhat. Hurray. Due to the nature of the contractions, the invariable comparison to childbirth is drawn. Now, I’m not exactly a fan of comparing anything to childbirth. As far as I’m concerned, the absence of a womb robs me of the right to assess the pain of delivery. Plus, every instance is different. Ask any mum with more than one child. Following that logic, no guy should ever presume to liken the two experiences. Maybe the contractions experienced by our progressive friends, male seahorses, may be more of an apt comparison. The blighters actual handle gestation and delivery while the lady focuses on churning out more eggs. Equality right there. So if you know of any seahorses fluent in English, send them our way. Slightly dazed from the exertion, I lose my way in the Marks and Spencers downstairs. There’s that warbling tendril of weakness that snakes out from my truly spent core. Sitting down in a chair is slightly uncomfortable as the weight of the upper body rests on the tender muscles. THe next day, full DOMS sets in as my unconditioned abs begin recovery from the first strain they’ve had in months. Laughing is a chore, twisting the torso is an ordeal, and I want nothing more than to sprawl on a flat surface and call it a day. So, in short: It’s the equivalent of a good workout to exhaustion. I can’t quite reconcile this feeling with my post-workout days of the past? Soreness be damned, I’m literally reaping the benefits of having done a thousan crunches, without lifting a literal finger. Post-session aches dwindle down to that tightened core you get after a good workout. If you came from ground zero, as I did, you’ll find newfound (or regained) core strength that wasn’t there before. Cursory sets of 10 leg raises and crunches were definitely easier to get going by the end of the last session. My weight wasn’t taken right at the end of the four sessions. Bold move by the clinic, considering Christmas had then been around the corner. You’d think they’d want to log some successful results before the most indulgent period of the year. Nope, Dr Chee assured. Courtesy of my newly-constructed core, fat would only continue to burn for a good month, even without exercise or watching one’s diet. I decided to see if those words would ring true. And so began an entire fortnight of boozing, hosting, office parties and year-end catchups. No compromises on diet, nor special attempts at exercise, were made. This, so as not to taint the results. I am committed like that. When I was finally hauled back for the post-session review, I had somehow still lost 2.1kg. Overall fat percentage was down 3 percentage points – although admittedly, there was a lot to work with in the beginning. My muscle mass had also crept up by 0.5%, despite an extremely inactive month and plenty of back-to-work snacking. End Results: Down 2.1kg, 3% fat; muscle mass up 0.5%. Both ‘before’ and ‘after’ measurements were taken before dinner, so it wasn’t a matter of weight difference in the morning. Not a bad haul at all. Can this build a complete gym bod? Piqued by the results, I ask Dr Chee if the tech’s going to be able to tone other parts of the body. He reveals that similar treatments for the thigh and possibly bicep areas are undergoing testing with the Federal Drug Administration (FDA) before they can be rolled out across the world. In addition to the already existing buttocks toning (favoured by the ladies), this bodes well for executives and upper management who’re willing to fork out some thousand quid per session. The Chelsea Clinic has at least one male client who’s been on Emsculpt for months – to great effect. After the first four sessions, only monthly visits are required for upkeep. You won’t be able to get that beach bod just with Emsculpt, however. There’s one muscle that will almost certainly never be safe to treat with the Emsculpt machine – the pectoralis major, for the obvious reason that no one’s going to be pointing a muscle-inspiring piece of tech at the heart. So if you’re planning a future with Emsculpt, you’re still going to have to hit that bench press. There’s nothing to fault and everything to like about The Chelsea Clinic. Cream and wood interiors make for comfortable waiting. Not that there’s much waiting to do, either. There’s a healthy crowd here during the evenings – a natural testament to the quality of the clinic – but the appointments were well-kept on all four of the treatment sessions. The staff are presentable, personable and efficient. The size of its treatment rooms are par for the course – real estate here doesn’t come cheap. All the place needs is some piped-in music. It’s tucked away in the higher floors of Wheelock Place, so it’s convenient yet discreet to visit. Now, when’s that effortless bicep coming along? The Chelsea Clinic, #05-08A, Wheelock Place. 501 Orchard Rd, S238880 . Tel: +65 6735-8833. 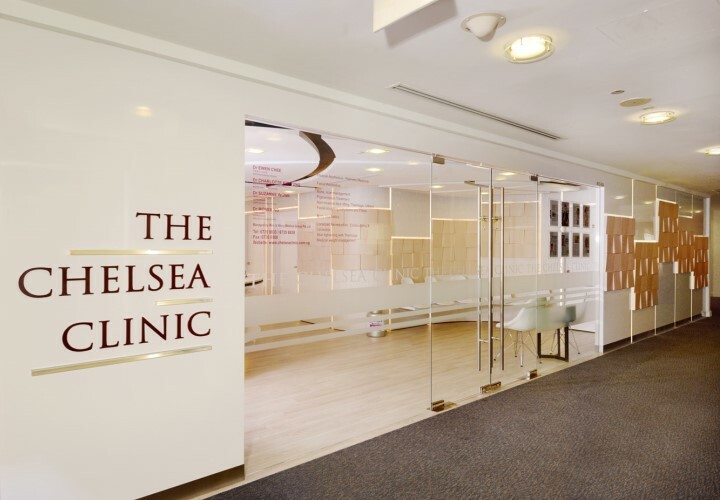 IMAGES: Treatment images via The Chelsea Clinic. Cover image: John Fornander on Unsplash.